Even the happiest of professionals can admit that they dream of retirement from time to time – and maybe even more frequently. And, why not? For many, retirement means more time to spend with those you love, doing the things you love. But when you’re used to an income that allows you to live a particular lifestyle, then that income changes, it can be difficult to maintain the lifestyle you’ve grown accustomed to. Some retirees look at the lifestyle change as an opportunity to sell their home and simplify. Some homeowners decide to stay in their homes long after retirement. How will you know what decision is right for you? 1. You need more money. Selling your home when you retire will allow you to downsize and simplify a bit, which can equate to fewer financial commitments. However, if your home is paid off, selling might also add to your retirement funds, which will allow you more freedom to travel or enjoy the things you’ve been looking forward to. 2. You’re looking for less responsibility. Owning and maintaining a home requires quite a bit of cleaning, seasonal maintenance, and upkeep in general. When you sell a larger home to move into a smaller space or one with added amenities, like landscaping or housekeeping, you can say goodbye to some of the time-consuming tasks that come along with home ownership. 3. You feel like you don’t fit in. When you’re a new family and you live in a neighborhood with close neighbors who are at similar stages of life, the sense of community can be amazing. If you grow older and notice that your neighbors seem to be turning over every few years, new families might remain the community norm. If you’ve watched your children grow up and leave the nest, it may be your turn to flock to somewhere new next. 4. Your retirement plans include a lot of travel time. If your retirement aspirations have you sailing around the world or visiting cities and countries you’ve never seen, it simply might not make sense to hang on to a big home. If you do, you’ll need to hire someone to handle the regular maintenance and upkeep responsibilities. If traveling is high on your retirement priority list, you may only need a small crash pad where you can stay between trips. 5. If you have children, they have moved away. For grandparents, retirement can mean taking on a new role of spending more time with their grandchildren. If your children have moved away and seeing your grandkids means you’ll need to leave your home for an extended period, it may not make much sense to keep the home you’ve been living in. On a similar note, if your children have moved away and you intend for them to be your heirs, it may make financial sense to leave them a nest egg, rather than a piece of property that is far from them. They’ll eventually have to sell or hire someone to look after the home, which may not be financially worth it! 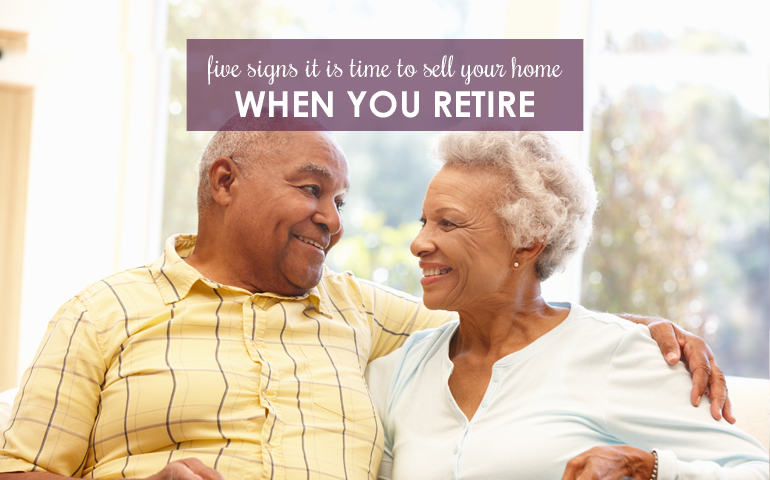 Trying to decide if you should sell your home at retirement? Let us help! Contact a Berkshire Hathaway HomeServices The Preferred Realty professional today.